Agri Labour Australia can rapidly find, screen and deploy quality casual staff for your season, harvest or other agricultural project. We have an engaged database of candidates who have proven themselves in previous roles. Sourced from networks at home and overseas, our casual candidates are reliable, hard-working and fully prepared for the demands of the job. With our decade of industry experience and country roots, Agri Labour Australia understands that agriculture is unique in terms of its challenges and workforce demands. This has never been a ‘9-5’ industry, and neither are the workforces that power our farms and produce companies. Whether your recruitment needs are high-volume or one-off, our Casual recruitment team can meet the brief in record time with employees who hit the ground running. This applies if you need lots of hands on deck for a 4-month season, or you just want to fill an emergency gap ASAP. Whatever it takes to get the job done, Agri Labour Australia is better equipped than any other recruitment team to assist. Agri Labour Australia has the largest network of offices in the agribusiness recruitment sector, with locations in Toowoomba (Queensland), the Sunshine Coast (Queensland), Melbourne (Victoria), Renmark (South Australia), Tasmania and Taiwan. This network of offices are supported by our head office located in Brisbane (Queensland). We use candidate-sourcing and recruitment methods that make the most of modern technology for unmatched speed and reach. As our candidates move from job to job, we continually engage with them to ensure their wellbeing and that we retain their skills within our harvest trail. On a personal level, we use communication strategies and database management to keep in touch with candidates and get the right opportunity in front of the right person – no matter where they are in the world. Our dedicated recruitment team follows a strict but flexible process when filling casual workforce requests. We work collaboratively on all client projects. While everyone is across everything, you will only deal with the one point of contact – your account manager. Not only does this allow us to maintain efficient processes and select the best candidates, it also keeps us flexible. If you have an urgent request or an atypical job, our team will work together to share information and find the most suitable person for the role. You may need semi-skilled workers for just a few weeks, skilled employees for a lengthy stretch or a mix of staff for a season. Whatever your casual requirements, we can find your people. We have access to vast networks of workers at home and overseas with every type of agriculture skill. 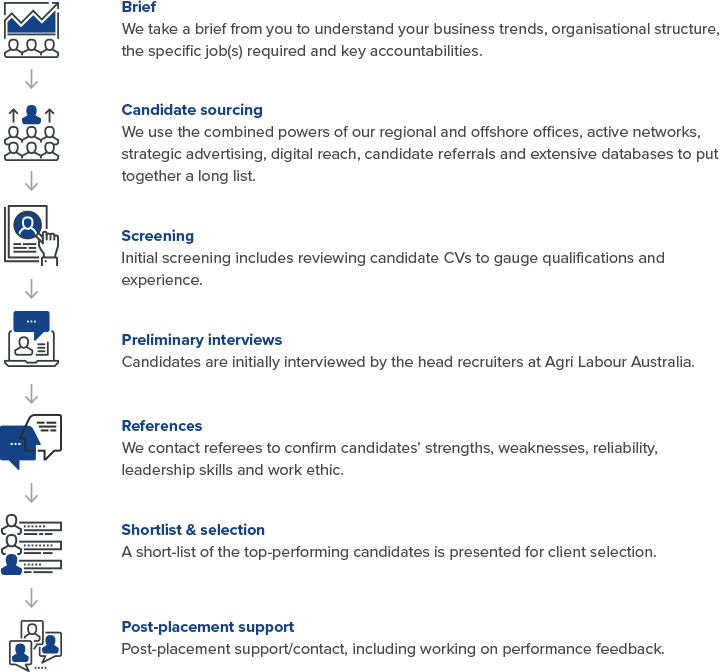 Our blend of candidates has everything you need to build out an optimised workforce. Agri Labour Australia recruiters are in touch with workers with on-the-job experience in a broad range of agriculture sectors. Clients benefit from our engaged database of candidates with useful skills who have proved themselves with us. We can move complete crews from one site to the next with a short lead time. This pleases both our clients, who want experienced people for an immediate start, and our candidates, who want continual work for a full calendar year. Structuring workforces in this way also minimises training costs and maximises productivity. For the purposes of health and safety, all Agri Labour Australia casual candidates undertake online and on-site inductions before reporting to work.